How do free apps make money? Ever thought how to make money from mobile apps? This article is for entrepreneurs who want to learn – how to create and monetize an app or make money with apps to earn passive income by publishing free apps in the mobile app market. 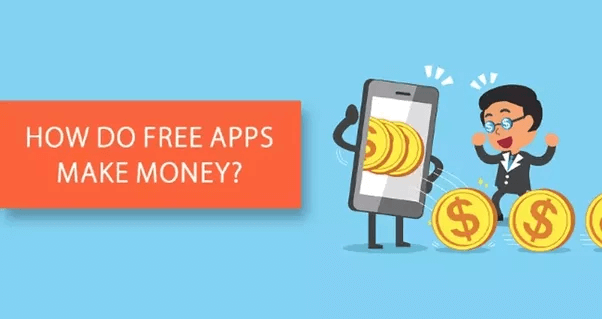 As free apps have always outnumbered the paid ones (in terms of profits and download numbers), most of the people often ask a common question that – how much money do apps make. How do free apps make money? Ever thought how to make money from mobile apps? Before we answer that question, the first thing you need to know is that the app boom hasn’t ended (and it won’t), according to Techcrunch. Even though the percentage of paid app revenues has decreased to 37.8 % from 75.9%, the mobile app market is still worth billions of dollars. The experts also predict that, between 2016-2020, global app revenue will double! So if you think that free mobile apps are not as profitable as much as the paid ones, then you couldn’t be more wrong. The fact is, 98% of worldwide revenue comes from free apps, according to Google Play. And, you need to think more about app monetization. Techcrunch also says that more than 90 percent of apps on the market now are free. 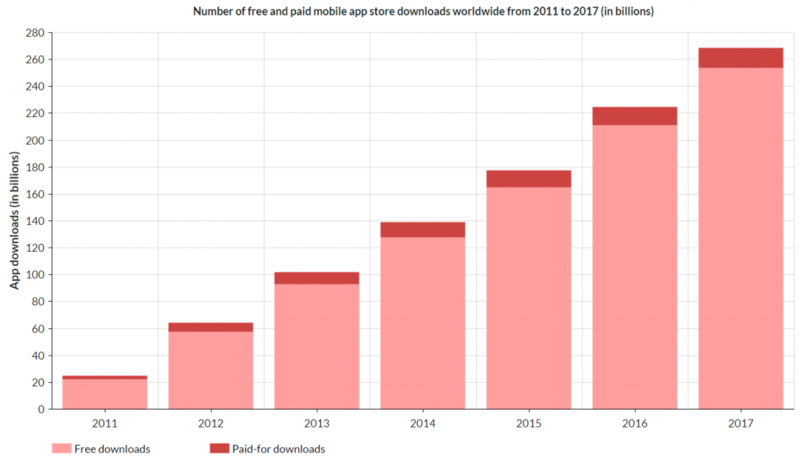 And, the revenues generated from apps that charge for download (paid apps) are expected to go down in upcoming years. Now if you want to learn how to monetize your app or how do free apps make money without an ad or how do apps make money, then you’ve come to the right place. We’ve already worked with many Entrepreneurs in 6 years of our journey and helped them convert their ideas into the best money making apps. 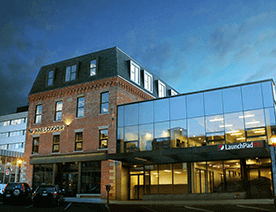 In fact, our clients admire the expertise we’ve on photo and video app development. And because of that, we’ve been able to build mobile apps that make you money, and can generate a good amount of revenue for our clients but also got ranked on the list of top photos videos apps category. If you would like to learn more about these top photos videos apps developed by us, then click on this link. So, if you’ve decided to develop mobile apps to make money and wondering how to create an app and how to make money off an app, then in this article, you will learn about the most popular and proved mobile app monetization strategies to make money with apps. 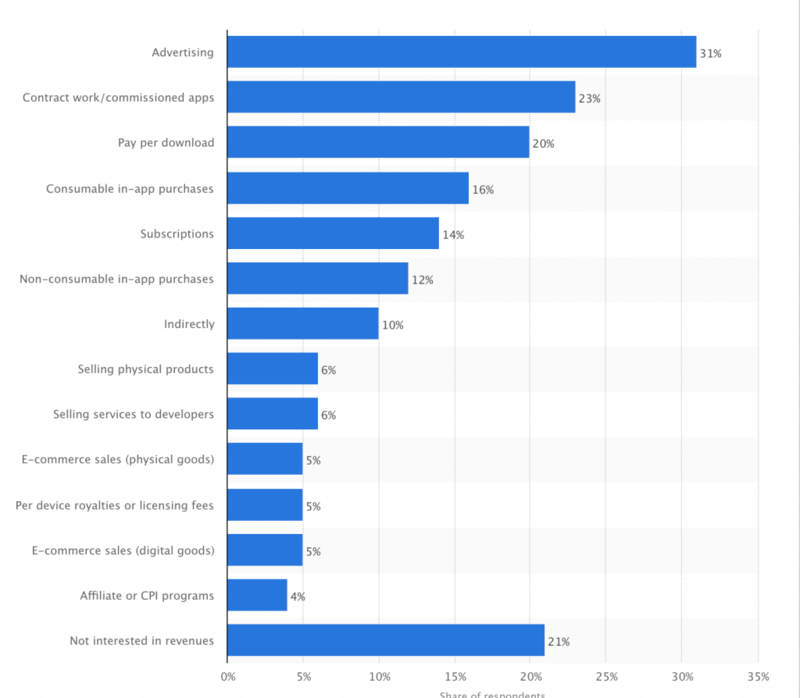 According to Statistica, in 2015 these were the most popular app monetization methods used by top app publishers. Ok, so you can clearly see that there’s a lot of different ways to make money with mobile apps, but which are the top options here? How do people make money from free apps with these ways? To find out, let’s analyze the top and most popular revenue models of free apps. Advertising is probably the most common and easiest to implement, and it is done via a third-party ad network. 7 out of 10 free apps providers used advertising as their revenue model in 2016. Using ads to monetize apps and make money is quite simple. An app owner just needs to display commercials inside their mobile app and get paid from the third-party ad networks. You can get paid every time an ad is displayed (per impression), per click on the ad, and when a user installs the advertised app. There are mainly 4 types of ads that are displayed by the app providers for monetization. This type of ads is full-screen pop-ups that are displayed at specific time frames. Users can close this ad by a close button at the upper left or right corner. For example, an ad can be displayed when a user finishes editing a photo and saves it in the gallery. This method is used by Gaana, which is a great example of app monetization. They are basically displayed in different sizes and at the top or bottom parts of the app screen. They are often small and less obstructive which helps users to freely use the app. 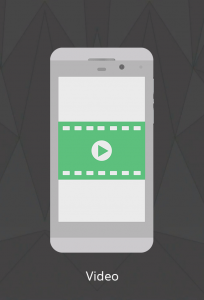 These ads are displayed automatically and generally used as a reward video in exchange of some in-app reward. 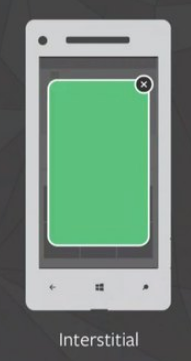 For example, by watching the ad video, the user can get the app currency which can be useful for either unlocking levels in the game or getting additional features. 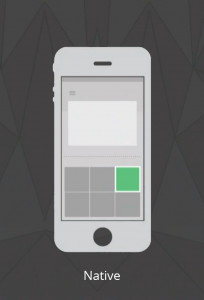 Native ads are integrated to appear as a natural element in the app. Most of the times, it is manifested to promote a product or a mobile app. This method is getting more and more popular these days because the users are less irritated and intrusive with such ads. However, one point that you need to know about native ads is that their revenue can be pretty low compared to other methods. And despite the mobile app developers think of native ads as the best strategy, it is the most hated by users. These types of ads are displayed usually between the activities or the pause between game levels. Interstitial ads cover the full screen of their host app. Whenever an application shows an interstitial ad, the user has the choice to either tap on the ad and continue to its destination or close it and return to the app. Subscriptions can be a quite useful monetization strategy. 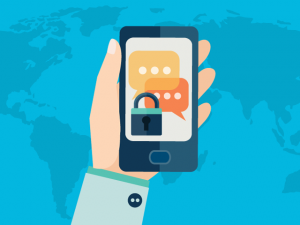 App publishers can choose to offer free content in their apps for a limited amount of time and then charge users for a subscription fee that will allow them to access full content without any restrictions. The popular and common technique used by the majority of free app publishers is to offer a free trial period and then charge the subscription fee to those who wish to continue to access the app content. This type of monetization strategy is often used for cloud services, audio and video streaming, and online news services. 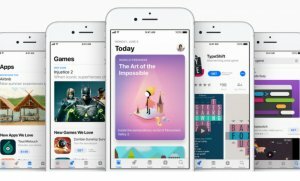 To ease the integration of this revenue model, Apple is paying extra attention and making significant changes in how app subscription models work. In the present model, Apple will maintain its current 70/30 revenue split for the first year of subscription. After one year, the new 85/15 revenue share will automatically be implemented. This new format was made to encourage the app publishers to sell their apps for a recurring fee instead of a one-time cost. But despite this, only 5% of the most successful apps are using a subscription revenue model or developing subscription-based mobile apps, according to Sweet Pricing. 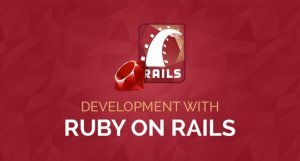 Want to develop your own mobile app? Another innovative approach is to sell merchandise in your free app. Many e-commerce businesses build free apps to sell physical goods such as toys, shirts, shoes, etc. these physical products can be sold directly to the app or via email marketing. To encourage app publishers to use this monetization strategy, Amazon has started a service called Merch by Amazon that allows publishers to create their artwork, upload it to their platform and promote their products. To make things easier, Amazon even takes care of the payments and delivery of items. In-app purchases are directly made from within the app and are usually quite a simple process. They’re typically used to access special contents or features such as powerups, restrictive levels, or additional features. In simple words, in-app purchases provide an ability to sell a variety of virtual items directly from the app. According to Forbes, apps with in-app purchases generate the highest revenue for their publishers. This monetization strategy is also expected to dominate in the years to come. Generally, this model is used by game publishers, mostly because of the digital money. In fact, half of the games provide more than one game currency such as gems, coins, and gold. Overall, this is an interesting model for converting non-paying app users into paying users without being too intrusive. Although, you’ve to keep users hooked to your app so that they keep paying. Well, both UK agencies and advertisers are now spending the majority of their advertising budgets on mobile. The reason behind investing in in-app ads is that the format is more reliable than mobile browser ads. Moreover, improved engagement is another core reason behind this. Sponsorship is one of the less commonly used monetization methods, but it can be still an interesting strategy. In simple words, Sponsorship in your application can be a powerful app monetization strategy if the app publisher builds the right niche app for a targeted audience and launch it on behalf of another company. Similar to websites, app publishers need to consider sponsors whose target audience is the same as the one being addressed by the app. Before building the app, creating a list of organizations and brands who could benefit from the partnership is a good starting point. A good example of this strategy is Home Depot sponsorship on the Weather Channel App. the animated app background behind the temperature measurement is the advertisement placed by the sponsor to target homeowners interested in weatherproofing their houses. Referral marketing involves promoting a third-party product or service as a way to optimize revenue opportunities. App publishers can promote or sell affiliates’ products or services based on the number of clicks or installs. For this, you can use pop-up ads to promote someone else’s app or advertise products. There are different types of referral marketing models that publishers use in their free apps. There is a number of affiliate networks from which you can find the one that suits your free app. In this model, you can either promote other apps, advertise products with pop-ups, or promote apps through an in-app store. This type of revenue model is based on a number of clicks on an ad displayed. You can join the popular networks such as Adfonic or Google’s AdMob for this model. They both provide text and display advertisements. 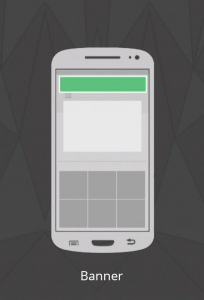 This model involves charging based on the number of ad interactions or video views. 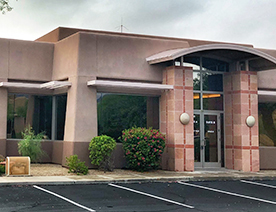 Smartphone game development company BrightHouse successfully increased its app revenue by 130% through cost per view networks. They used video as well as interstitial ads in their smartphone game to create natural breaks in between game sessions. Cost per install is a relatively new marketing mechanism and is mobile equivalent to CPA (cost per acquisition) in the web marketing world. Cost per install is exactly what it sounds like – you get paid for each install of the advertised app in your free app. There is a number of platforms providing software to install into your app. The best example of this model is Chartboost and Playhaven. Both are third-party networks that have software that you install into your app. The fee for this network ranges from $0.80-$3.00, and online affiliate networks have a range of campaigns for global traffic generation while promoting other apps, making it a lucrative market to play. This means the app publishers can sell their users’ behavior data to these researchers and make a handsome amount of money. The data generally contains users’ email addresses, social media accounts, and their personal preferences. There are two ways to benefit from this model. You can either track what users do and sell data to outside companies and researchers, or you can use the raw data for your own purposes. From a marketing point of view, companies want to pay for displaying ads to the most relevant audience. So if you can gather enough relevant data, then you can have a way to make a profit out of it. When it comes to talking about freemium upsell, freemium apps are available free of cost to download but contain paid or premium features. 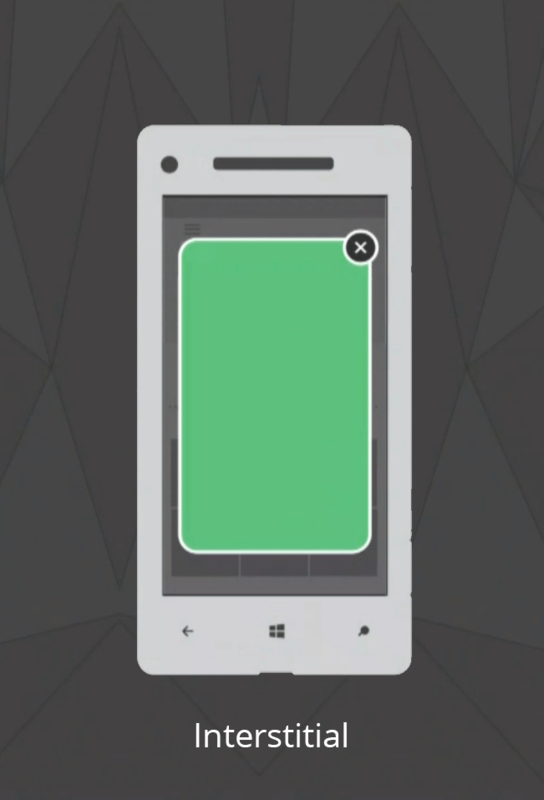 These paid and premium features can be accessed through in-app purchases. In this type of apps, users download the app without paying any charge, and if they like the content of it, they can get full access to functionality by committing a purchase. Using this tactic, gaining lots of new users is easily possible because premium features are optional. Moreover, this strategy is extremely common for education and health and sports application, allowing users to get premium features with a particular cost. There are many eCommerce businesses and startups that have started using free applications for selling their products or physical goods like mobile cases, t-shirts, toys, etc. via developed apps. Let’s take an example of one such free application, Angry Birds, that increased the profit from branded products. Through this free gaming app, Rovio company sells approximately 1 million branded t-shirts, backpacks, and stickers every month. In fact, Amazon is offering a way to get revenue from merchandise by creating a Merch self-service program to sell custom branded t-shirts from their apps. The ninth best way to monetize your apps is transaction fees. It is the best way to make money from your free apps. It is especially possible with those apps that provide a platform, where digital transactions occur on a regular basis. Let’s take an example if your mobile app has an option for third parties to sell their products and those purchases can be carried out online, then you can charge transaction fees. You can charge a small fee for every single transaction that occurs on your app and makes a lot of money. Another monetization way to make money from free apps is crowdfunding, which is new in the industry. In this method, startups and companies share their idea on platforms like Kickstarter, Patreon, Crowd Supply, Fundable, Indiegogo and Chuffed in search of donations to fund the development and promotion of the application. According to Mobile Growth Stack reports, non-gaming mobile apps are highly preferable in crowdfunding. As of May 2017, there were approximately 138 non-gaming apps that known to raised fund between $10,000-$100,000 as compared to 29 mobile games that got a similar funding goal. Share these 11 proven app monetization methods with your friends with just one click! As you can see from the above-mentioned statistics, the growth of the mobile app market isn’t stopping anytime soon. Despite increasing competition in the industry, publishers are also applying new monetization methods and creating more useful free apps for users. None of the above-mentioned monetization options could be described as inefficient. In fact, app publishers have gained skill in using these models in particular cases. For example, the subscription model works only for a certain niche but is the most profitable of all if deployed correctly. Besides this, hybrid monetization models, such as in-app purchases and in-app ads, are clearly gaining popularity in the business world. Most publishers say that in-app advertising is set to be a key driver of overgrowth in upcoming years. Only time can tell the real truth of how the mobile app market will develop. But for now, current market trends show that the market will continue to generate higher revenue in the foreseeable future. With so many app monetization models to make money with apps, it is important to note that each method has its own benefits and drawbacks. However, trying out these tactics and analyzing what competitors are doing is a good starting point. Now, you might have got the answer to your questions like how much can you make from an app, how free apps make money, how apps make money and how to make money off a free application. 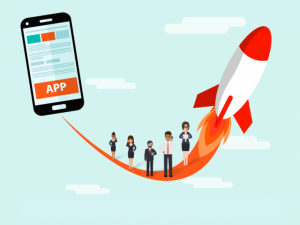 So when starting your mobile app development, you should take the app structure and target audience into consideration before choosing the monetization strategy. 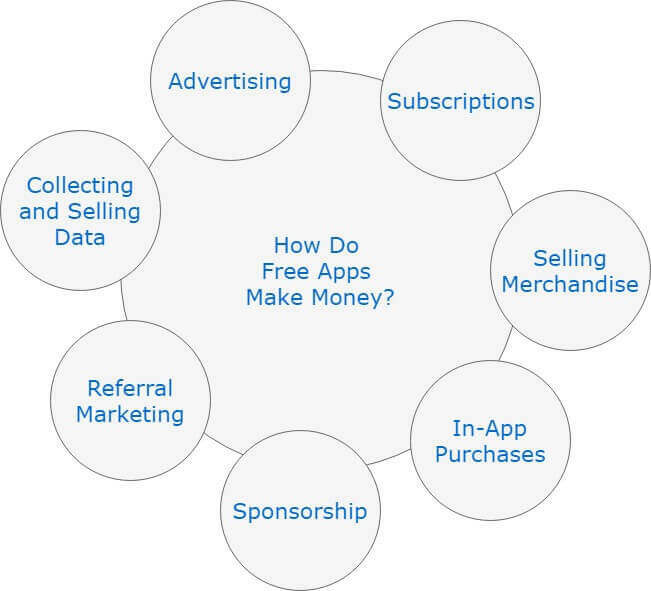 How to monetize mobile apps? How to make money off an app? How do people make money off free apps? How to make money from app development? How to make money from iOS apps or Android apps? How do you create money making apps in simple steps? 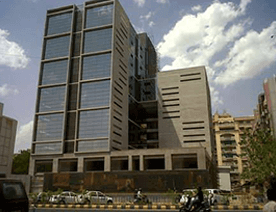 Then you can get in touch with us through the contact us form. One of our sales representatives will revert to you as soon as possible. The consultation is completely free of cost. This page was last edited on April 16th, 2019, at 8:41. Want to Develop a Money Making App? Get Free Consultation Now!